Mr Looking Our Best has always had a thing for Emmylou Harris. He only has to hear the opening strains of Boulder to Birmingham to become all misty eyed then waxing lyrical on the meaning of the song (the demise of Gram Parsons at Joshua Tree National Monument in 1973, apparently). These sentimental reminiscences are the cue for the younger inmates at LOB Towers to don their headphones and edge towards the door. But there is no denying the talent of Emmylou (65) and a career spanning 40 years with 25 albums, 12 Grammys, and now a new record with Rodney Crowell, Old Yellow Moon, released this month. Our Em sure can belt out a tune, but it’s not for her way to rock a country ballad, but her way to rock a fab grey mane that puts her in the picture in this week’s post. Alas, LOB and her fifty-something pals don’t look (or sound) remotely like the wondrous Emmylou. We are instinctively wary of letting our barnets gradually evolve into something resembling a Brillo pad. It would be like we have given up, and now referring to clothes as ‘outfits’ and having coffee in supermarket restaurants. 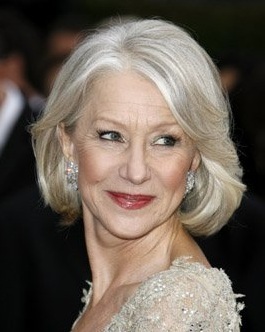 Going grey is nature's way of complementing skin which lightens in tone as we age, and so a paler hair colour can complement that gradual progression to a paler complexion. Very dark hair can look really harsh against older skin, which is why a former brunette may make the transition to blonde later in life with a natural grace. The vanilla and beige blonde shades are flattering to paler skin, while any dreaded brassy tones can be toned down with one of the professional purple shampoo/conditioning combos, such as Clairol’s Shimmer Lights, or Joico Color Endure (available from selected salons or online). Also for fading blondes, but especially reccomended for white or grey hair, is Aveda’s Blue Malva shampoo and conditioner. Online endorsements say the bluish-purple formulation brightens grey hair to a silvery shine. 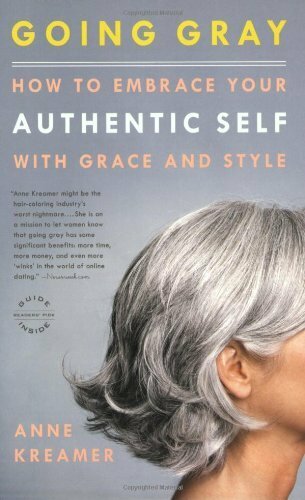 There are positives to letting hair go grey or white naturally, as attested by Anne Kreamer in her book Going Gray (published Little, Brown & Company). The author found that colouring her hair actually made her look older, so she decided to grow out her grey, and has no regrets.The book examines the cultural pressures and self-images that connect to dyeing hair, especially for mid-lifers (and that includes the menfolk and their Grecian 2000). Kreamer writes that fewer than 10 percent of American women coloured their hair in the 1950s, compared with up to 75 percent today. While worrying about hair colour sounds like vanity, in our youth orientated society growing out the grey affects anyone concerned about age discrimination and how that may impact in terms of workplace opportunity. There's also the little matter of trying to tell your hair colourist that you want to let nature take it's course. Your salon may not be all that thrilled at your cancelling those expensive 6 weekly re-touches, so perhaps don't expect advice, much less, enthusiasm. who fully embraces her starry silvery strands – and even dyes them pink when the fancy takes her. For the rest of us, the dilemma remains – should we just fade to grey? LOB could sure write a mournful ole country ballad just thinking about it ….